It's amazing how uninspiring a potential job loss can be. Right now my company is running on fumes, and just the other day our president implied that if things don't turn around soon, we could be out of business by the end of summer. Gulp. So currently I'm in the process of gathering and weighing my options... which don't weigh very much by the way. But being as how I've accumulated a grab bag of various skills over the last 20 years I do have some alternatives at my disposal - but certainly nothing that is guaranteed to be career sustaining. Over the next few weeks though I will be asking for your help. Don't worry, I won't be begging for donations (yet), but more along the lines of helping to spread the word about a few things I'll be promoting. For example, my son and I will be starting a web-based service that will need some traffic attention to help boost it in the Google ranking. Stuff like that. So if you're wondering why there hasn't been anything fun to read around here lately - this is why. I'm sure that once I have things figured out I'll get my blogging mojo back, but right now I'm a bit too distracted to produce anything clever. So please bear with me as I get my ducks in a row, because this could take awhile. I mean, come on... you know how hard it is to get ducks in a row. Let me know what I can do, I mean my blog isn't the most visited (by far! ), but I might be able to send one or two your way. Hope things work out for your company. Good luck in everything. Let me know if there's anything I can do. I'm there. Whatever I can do. Jeff, I used to know a little something about search engine placement. Back in the day I had a few clients with number 1 listings. Things have changed a lot since then but some basic things haven't. I could help there perhaps? Also Google ads targeting...I know a little....not a lot but a little. Email me with the subject you are doing your web page on if ya like. I'm sorry, Jeff. Don't worry about your mojo or your readers -- neither of them ever really go away. Mi sidebar es su sidebar . . . you know, if you need me to pop in an ad or something for your new site. I'd be happy to do it. Those are some very cute little ducks too. Good luck with the job stuff. I've been looking for a few months and have been doing/ trying the work from home thing. Jeff, Now you will see that you have a lot of friends among bloggers that have figured you out as a great guy, so perk up. We do not have a lot, but if you need money, all you have to do is call. This could be your greatest opportunity, and you could at least tell us what happened in Harrisburg. Kathy pointed me your way. I've added you to my reader, so when those ducks get in line I'll know. That is such a stressful situation. My folks live in St. Cloud. Dad is retired from SCSU. Small world. Me sidebar esa su side....what JD said. My sidebar needs sprucing up, so feel free to send me anything to post. roger - Thanks Roger. I appreciate that. people in the sun - Will do. I'm not afraid to beg. Er... I mean ask. kathy - Awesome. I'm counting on your help. windyridge - Perfect. I'll be in touch. Thanks! jd - Ooh... I'd be lucky to be on your sidebar. I'll definitely take you up on that! laura - Unfortunately there are too many people looking for work these days. Thanks for stopping by! bill - You're right about that. My blog friends are the BEST! susan - Guaranteed! You all are the best. Let me know what you need, man. Good luck. Including you and VE I think I have about 4 people who read my blog, so I can't really help there. But any other way just let me know and I'll help! I'm here for you too, Jeff. Just was reminded about this by Kathy over at Blog Catalog. Whatever you need, I also can help promote your CD on my blog if that helps. Let me know. Ugh, good luck, Jeff. It's hard just waiting for the axe to fall. I'm there with you, although there's no one admitting that we're in that deep of trouble. But it's not hard to read between the lines -- thank you Senator Dodd btw! Here's hoping you find a happy solution. I agree this economy is anything but funny. We are doing okay but only because we have great family. There have been not so fun things happening around here too. Hope things turn around for us all! Sorry to hear that. Getting ducks in a row is a tough gig, but we're all here for you. Don't sell yourself short, Jeff. You've had lots of posts that weren't funny! I'm here for ya, man. Ask away. diesel - Thanks. I dig a mean ditch if you need any help. elizabeth - You have no idea how excited *I* will be when you get your referral. Can't wait for the good news! unfinishedrambler - Yes. EVERYTHING helps so I probably will take you up on that. I'll get back to you on that. Thanks! michelle - No doubt... a happy solution would be good. heather - A few years back I almost took a job with Craig's company. We were almost co-workers. Small world huh? dan - Well said, in true Brit fashion. Thanks for the good wishes. mom thumb - Yes, those little buggers don't listen very well. 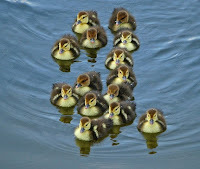 And if you think ducks are tough to straighten out, you should see how hard it is to get goslings to cooperate! ed - Oh, you're a riot. ;-) Thanks Ed. I'm not afraid to ask, that's for sure. Jeff...I'm right there with you, my friend. I got my layoff on Tuesday (after over 17 years). This marks the first time I've been without a job since I was 13 (other than school). Weird thing is...I'm not worried. I have so many ideas I've wanted to pursue and now is the time to finally do so. You know I'll help in any way I can; just ask. Good luck, of course. But you probably won't need it. You're extremely bright and talented. You'll make something positive happen. Have you ever said on here what it is that you do exactly? I think our next trip down should include a stopover to order some of your awesome carpentry work. And remember, Hubby has been laid off since January, and things have been going along fine. Life just finds a way of working out somehow. Don't stress about what you can't change. Both myself and my wife were made redundant in April and our company is in liquidation now - I was lucky in that I was immediately re-employed by our head office and I work for them now but the wife is out of work and banging her head against the brick wall that is our unemployment benefit system, or the National Lottery as we like to call it. On the web site optimisation thing, one of my newly appointed tasks is the redesign and publishing of our three company web sites, and to get them optimised properly, I'm loving this job and I get to work from home now, so the first message is that sometimes the grass is greener on the other side, the other message is that if I can help with the knowledge that I am currently accumulating from a search engine consultant that I've appointed then let me know. Jeff -- I just had a thought. Have you looked into your local chapter of the Small Business Development Center? We have one at my university and they do amazing things to help people get off the ground and grow. You guys have the drive and talent that a place like that would welcome. The more the clients want it, the more they can help. Jeff, would you consider writing travel posts for Uptake? ve - Wow. I'm really sorry to hear that. The offer is totally mutual. Anything *I* can do for you as well my friend. avitable - Don't know that I have. I've always been a little skittish about talking too much about my job here on my blog. I'd hate to reveal too much and then get fired and then blog about it and then become famous and then... wait. jerrychicken - Yes! I'll take you up on that knowledge when the time comes. I love the term "made redundant." I think. kathy - Thanks Kath... I'll definitely follow up on that. idaho dad - I might, actually. I'll contact you offline. Thanks Phil. I will definitely promote anything you do on my blog, unless it has something to do with you being naked. But seriously, I am very sorry to hear this news. I hope and pray that your company stays afloat. This is very sad news. But what I know of you from your blog, you are very resourceful! I have no doubt you will succeed at whatever you do. I'm sorry to hear that. Best of luck to you. HI ya, hope all is well, haven't heard from you for a while. the french dude that finds things for people in the south.